Reasonably large single bar pub on the Shepherd's Bush Road. It's a Youngs pub, but is quite elaborately decorated. Seating is sofas and armchairs. The floor was still dirty on my Saturday morning visit, with the previous day's food still sitting where it was dropped. The 2 ales were Youngs Ordinary & Special. Was a convenient enough pub for me to kill 45 minutes, whilst I waited for better ones to open. But it's not one I'd rush back to. Agree with the previous reviewer. If you're in this area, the Swan is a much better bet. Gave this one another shot, but must sadly agree with many recent despondent comments about the demise of a good pub aiming to be a wine bar. The Youngs ale was OK but expensive. Nearby Nicholson poured a ton of money into creating The Swan on Hammersmith Broadway which is always busy. But Youngs have different ideas. 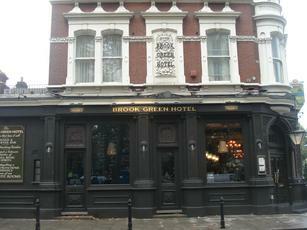 The Brook Green Hotel once had a following of the most local loyal customers.